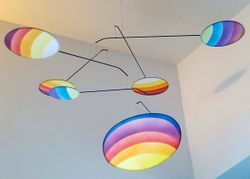 The Classic Lumen hanging mobiles are a under viewing mobile and have been our premier performer since it was first designed by Joel Hotchkiss in 1981. Still very contemporary and modern, the black aluminum framing outlines the nine colorful fabric combinations that we currently offer. A perfect design solution for over a desk, a couch or in a bedroom and appropriate in rooms for children of all ages from the nursery and up! All arms and fabric disks move independently 360 degrees. Each mobile is hand balanced and signed by the artist Joel Hotchkiss... Packed and shipped ready to hang. No assembly is necessary. Dimensions 22"H x 44"W. Interiors only. Alexander Calder made the mobile art form popular and was inspired by Joan Miro using bright, bold colors during the Mid Century Modern or Retro period of the 20th century. 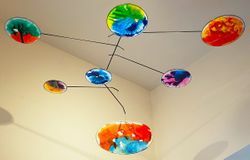 Now contemporary mobiles are used in a wide range of interior design solutions.